I worked for 13 years as the manager for Al Rayyan Farm in Qatar, one of the leading stud farms of straight Egyptian Arabian horses. When I decided to leave Qatar about two years ago, I changed my position to become the manager of Aljassimya Farm. I was intrigued by Sheikh Jassim bin Khalifa Al Thani’s commitment to breed his own show horses; a commitment that has serious long term responsibilities. I had the idea and good reasons to look for a farm in the U.S., a country that has a history of big breeding programs, and not just Arabians, but so many different breeds. Sheikh Jassim himself really thinks outside of the box and enjoys the research process, and he settled upon California. A few phone calls and a flight later I visited the Santa Ynez Valley, “The Valley of the Arabian Horse.” A year and a half later our farm is in development and several foals are on the way. The community has been so welcoming, making Santa Ynez and California really feel like home. Are the star horses lost this way? Is the quality lost this way? Obviously YES, these are the horses these breeders worked hard for, probably waited years for, and they should be the steppingstones to the next level of quality for their programs. It’s clear that some sort of action needs to be taken to help the breeders promote their full program at a lower cost. Without question, the first step that needs to be taken is rejuvenating our local market with shows and boasting about our horses. The Santa Ynez Valley is a prime example of all the above needs. There are many breeders, a lot of horses, but practically nothing is happening within the community — a community that has so many possibilities and the potential for real change if the breeders would come together. why their horse was chosen. And it puts some excitement back into our classes wondering who is winning — similar to many of the talent shows that are popular today. The class will then be placed and we will know why a judge chose the winners. The other three will not be placed, nor qualified for the championships. They enjoyed the experience of being at a show ground, building up confidence and experience and this will be an added value for their character and an added value in experience for their handlers. They will not have lost face or value. The championships for the show horses will be judged by the five standard scores: type, head and neck, body and topline, legs, and movement. The championships for the performance horses will be judged by a new set of scores: athletic structure, neck and shoulder, body and topline, legs, and movement. We will invite two show-qualified judges and two performance-qualified judges. Why wait? Let’s be adventurous. No more time to lose talking about it. If we want to change then let’s start doing it. 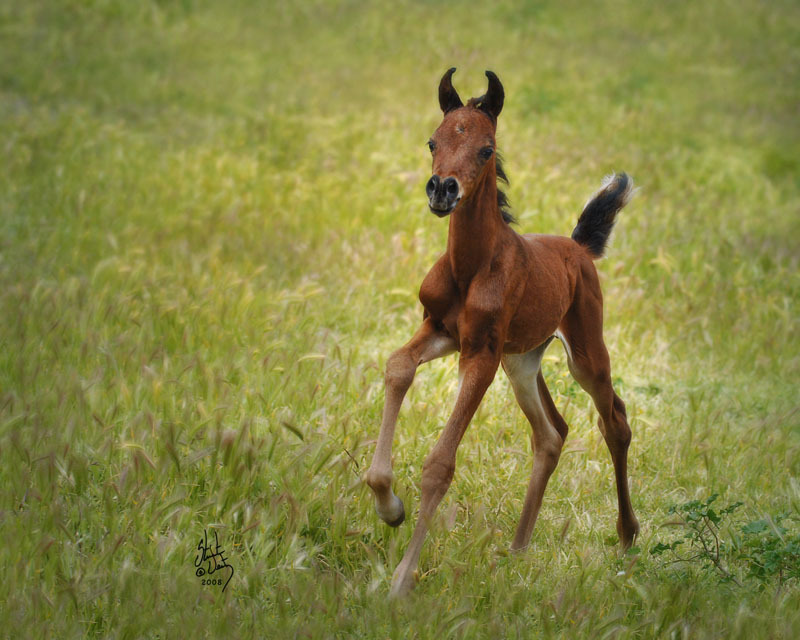 October 5 and 6 — the Arabian Foal Festival — Santa Ynez Valley, be there!